The nation — and the world — has been shocked and saddened by recent gun violence tragedies. There is some consensus that enough is enough, that the way we treat guns, gun laws, and gun culture must change. And yet, the National Rifle Association (NRA), the largest pro-gun lobby and one of the most influential lobbying groups in the United States seems to exist in a bubble of insensitivity. The worse things get, the more they cling to their guns, their loopholes, their fundamentalist laws, and, now, their games. "the NRA's new mobile nerve center, delivering one-touch access to the NRA network of news, laws, facts, knowledge, safety tips, educational materials and online resources....NRA: Practice Range also offers a 3D shooting game that instills safe and responsible ownership through fun challenges and realistic simulations. It strikes the right balance of gaming and safety education, allowing you to enjoy the most authentic experience possible." And the app certainly does offer invaluable and surprising safety tips like, "Use only the correct ammunition for your gun": "Never use alcohol or drugs before or while shooting": "Know your target and what is beyond it." 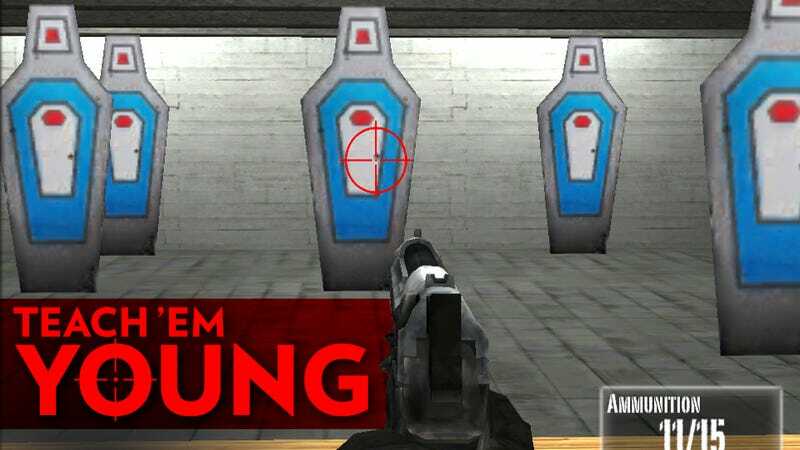 But the best part of NRA: Practice Range is a game which allows users to practice shooting at coffin-shaped targets with red bulls-eyes at the heart and head level! (See adorable screenshot above). I'm not sure whether that falls under an educational material or an online resource, but it sure sounds fun! And it's precisely because the app has "no objectionable material" that iTunes rates it appropriate for ages four and up. a 2009 amendment, snuck into a credit-card regulation bill, that ended a 25-year ban on bringing concealed and loaded guns into national parks. a 2009 repeal of an Amtrack ban on weapons. a 2005 federal law passed by Congress protecting gun dealers, trade associations and manufacturers from liability in lawsuits involving firearms used in crimes. The bill was sponsored by then-Senator Larry Craig, a former NRA member and talented toe-tapper. laws which limit the ability of doctors and insurance companies to ask questions about weapon ownership, usage and storage. But don't lose hope entirely. Despite the seeming omnipotence of the NRA, Joe Biden has outlined 19 different ways Obama can help control gun violence through executive action. I'll take all 19. Thanks.